I could find a place for parking, may be because the meet was arranged at an odd time - 12.30 pm! I walk into the TOI mini hall at 12.35, after signing as 21st visitor for the meet, and hear loud giggling sounds amid what looked to be a very happy environment. Birds with the similar feathers were flocking together. Men were in minority, and rarely one heard their voices. The trend continued, of giggling, of silence from men, of unequal ratio, till 1.10 pm when the build up to about 80 bloggers looked sufficient to start the proceedings. The trend was set by informing us that Bangalore stood no. 2 in the country as an unsafe city for women, after Delhi, perhaps. The happy environment melted away, and the serious business began. Many voices were heard, of complaints, of uneasiness, of disturbances. Bangalore is ruthless to the handicapped, physically and mentally challenged people.One does not leave the indefensible alone any where, and the other uses aggression to protect himself. 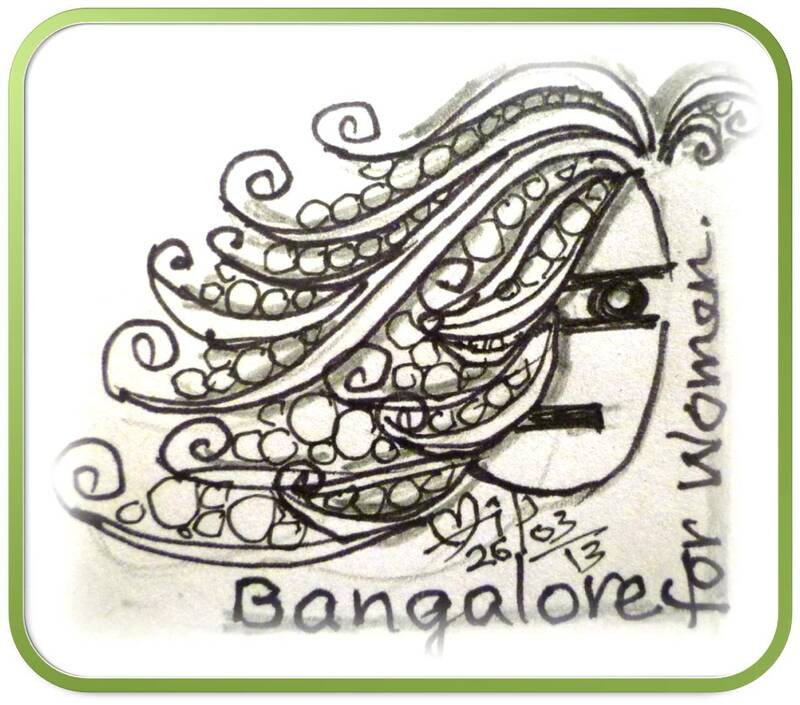 Bangalore is unfriendly to outsiders, those who do not speak local language. One decides to depend on technology for directions rather than ask people. 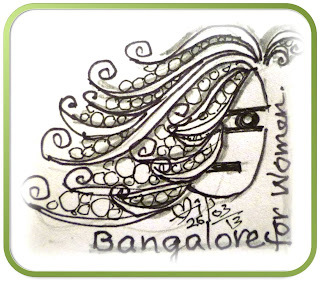 Bangalore is unkind to single women. Evicting a lady at the past mid night time, at 2.00 am, and terminating her 2 year old tenancy, just because she had the guts to complain about some lurid advances made by a two months old male tenant, by all means is inhuman. Perhaps the occasion was designed to draw out what was coming out of us. For the media, misery sells. And the inhabitants of the blog-world were pouring out to the media. For a moment I slipped into reverie. i came to this great city of Bangalore way back in mid '70s. Was Bangalore always like this? Not to my mind, though, my hunch is that if you pick up news papers of the past 40 years, you will find them replete with the stories of misery. To me, Bangalore has always been changing. It was an air conditioned city in '50s, a pensioner's paradise in '60s and a peaceful abode for the retirees in '70s. It was this benign weather that prompted the powers that be in the earstwhile era to set up educational institution like IISc, and later the five major public sector undertakings, viz, HAL, BEL, ITI, BEML, and HMT. Umpteen number of research institutions came up, and then many engineering colleges. All these organisations, on the back of great weather attracted people to come to Bangalore. The '80s showed rapid changes of the face of Bangalore. The city of theaters gave way to shopping complexes, and then to the city of beer bars giving Bangalore a distinction of highest beer guzzling city in India. Come '90s, and the city was abuzz with automobiles, one ways, and IT enthusiasts. A garden city was slowly turning into a concrete jungle. The weather, still with its relative superiority, was the reason, coupled with availability of good number of engineers through many engineering colleges here, for IT industry to take roots.The sky line has been changing rapidly ever since. The first decade of the new Millenium started seeing Bangalore grow vertically. More techies from all over the world started pouring in. Gated abodes, mall cultures and superior material life styles have created two Bangalores. One lives in digital world, and the other is off line. One is blaming the other for their shares of problems. Let me come back to the meet. A working lunch was served between 2.10 pm and 3.00pm. Back in the hall. Three members of the TOI editorial team were introduced ( Sorry I failed to register their names) to us. We were told that they were not 'public speakers', but, they were fine, and they did speak in public :-). The stream of conversations started again Just as I was starting to get uneasy with a one sided 'complaints only', discussions, a couple of posers brought back my comfort level. One, a lady questioned the dress sense of the present day young women with a specific instant in public place, and mooted if women should get sensitised to it, The dress issue is not important to me, but this lady's ability, and sensibility to look within for root causes of the strife in the society impressed me. Another whiff of cool breeze came when the young lady of the TOI editorial team offered a public apology to the blogger barely 3 months in Bangalore receiving 'unfriendly' treatment on road. These two random events give me hope. Yes, there is an urgent need to do introspection, and create a congenial environment for acceptance of our faults. And at the end, I would like to present my perceptions of the root causes, and perhaps remedies. I believe the problems are not unique to Bangalore alone. All over the country, and perhaps the rest of the world has caught the virus of greed, selfishness and consumerism. All the social strife and ugly phenomena are linked to this virus. Check this out and make correction at personal level. India I Care is a movement ( www.indiaicare.org) is our effort in this direction. How I wish all the bloggers subscribe to this movement and help us bring back the great character of this country we would like to be proud of .Please explore this blog for more info. Thanks IndiChange for this opportunity. ....Because the leadership today has stopped inspiring. Three major occurring in the past two decades have made it imperative to create new leadership from the grass root level. 1. Positive fruits of opening our doors to globalisation have been seen in the form of great boost to our economy. GDP has grown, and a huge chunk of our population has moved upwards in terms of higher purchasing power. 2. The phenomenon of Global warming, during these two decades, got established, and is no longer a debating issue. 3. Plethora of corruption cases came out in open and the ugly face of the leaders ( political, business, sports, social et al) got exposed. The combination of the above three phenomena yielded some peculiar outcomes. Not very positive, though. Our society became highly consumerist one, leading to even more desires, more selfishness and more greed. Poor grew poorer and rich richer. Crimes rate increased and trust levels reduced. Happiness levels came down. Industrial production started getting into overdrive. Hence more pollution and more vagaries of weather. Also, more fuel to consumerism. Concerned voices like Anna Hazare's etc got drowned as soon as they got prominent. A large section of the youth got under the effect of the opium of consumerist life style. Ire against corruption started cooling down as people started finding themselves at every level part of it. The net result is that the globalisation has not exactly delivered the desirable results. Leadership has failed miserably at all levels. People hate their leaders. Left to as is going on, highly excited and ambitious youth will perhaps get cast ,into the similar mould of leadership, over a period ,and much amplified, as they hate it today. Future would only look chaotic. There is an imminent need of raising fresh, genuine leadership from the grass root levels. Leadership that is not selfish, that which would integrate rather than divide, and that which will take the society toward sustainable living. The new leadership will have to move away from the GDP, and towards more meaningful parameters like health and happiness. There is an urgent need to change the DNA of leadership, and the crucibles have to be colleges where the seeds of a different breed can be sown amongst the future citizens. Some of them will govern our cities, states and perhaps the country some day, while others will be the wealth creators for the society. Before they choose their streams it is necessary that a positive leadership inception germinates in them to safe guard the future. Initiatives of Change (www.iofc.org), an International platform, and established in India (www.in.iofc.org) for more than four decades is busy bridging the divides in the world. IofC India has been, through its International center for training and reconciliation at Panchgani, Maharashtra, facilitating imbibing processes of effective living and leadership, heart of effective leadership and ethical governance and leadership for the last several years. The spectrum of trainees at IofC India includes IAS, IPS, IRTS officers, Military men, very senior, senior and middle level corporate and Government officers, workers and union leaders, Panchayat members, families, youth and students. The common thread in the training for all is, ‘be the change you want to see in the world’. No one goes back without getting influenced. Facilitation is done by the committed individuals who have brought about changes in their own lives, and hence they bring in convictions. They are drawn from all sectors and levels of services, enterprise and professions. India I Care (www.indiaicare.org) is an IofC movement, initiated by young people at IofC India a few years ago to ‘rebuild the Character Bank of India’. Having consolidated the concepts for the past five years, IIC is now ready to reach out to the wider segments of the society to bring about the desired change. College students are one important segment, and the Leadership Inception is the medium of the program. A semester long program called 'Leadership Inception', designed by the experienced facilitators at IofC, to be offered to colleges in India. The program will be, largely, experiential and experimental process. The processes will help the young minds to examine their world view about leadership as it may exist in their minds, check for its efficacy, and rebuild it to deliver the tough and very different needs that will arise in the coming decades. A speaking certificate offered to the students opting to go through this experiment will decisively add value to the student's CV. The structure and portions of the course contents are ready, and a pilot project is being planned for the coming academic year. Interested individuals and institutions are welcome to join us.Please send your contact details in the comments section to enable us to get in touch with you. 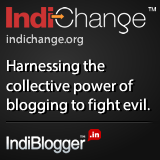 This post is published as an entry to ISB iDiya for Indi Change competition. Please visit http://www.isb.edu/idiya/ for more information. I will not tell you a lie. The picture you are seeing is that of my younger days. But, don't you, the human beings, do the same thing? So, this was my picture of my prime youth. Isn't it beautiful? I wish to tell you my story - in 4 parts, each part a decade of my existence. And covering lives of three generations, the so called my owners! If you come to see me today, you might see my new avatar, but mostly my door locked. But then it is not the first time that I have been locked up. Nor do I believe it to be the last time. Ups and downs, I have understood, are part of existence. So, shall we start with my first decade, the decade of 1970s? I quickly became talk of the town. Nay, talk of the village. Major populations in India lived in villages those days. Gujarat was no exception. I was beautiful, or would you like to call me handsome? I leave it to you. My owner, then, was a septuagenarian old man, very authoritarian, very dominating. He had lost all his lands to some Government laws during early part of India's independence. I was the only possession left in his hands! And so, he became very strict with his grand children. Dadaji, as he was called, would often tell them, ' We have no property. The only property you can build would be your education.' And, I became the only house in the village to have seen three doctors, two engineers, a pharmacist, a chemical technologist, a teacher and a microbiologist getting created under my roof. It was an era of education, and since our village bordered around an educational town, many relatives of my owner sent their children to us to get them educated. I became famous, and a name got attached to me - 'Vidya Dham', an abode of learning. Let me give you a quick idea about the social life that I had witnessed then. One day the post man came home with a message that a trunk call was to materialise for him from the neighbouring state. He rushed to the post office and waited for nearly 2 hours. Usually people anticipated a message of concern in such circumstances, those days. My owner's eldest son, known as 'Bade Bhaiyya', was traveling to a new and upcoming township in Madhya Pradesh, a neighbouring state, by train. And the trunk call message indeed was of concern. In no time the whole village knew that Bade Bhaiyya had suffered a heart attack and was pulled out of the train at a small railway station near Nagpur People started pouring in offering emotional, and monetary support for Dadaji to leave by the next available train. Communication, and commutation means were few, and far between, but people were close to each other. Came the decade of the '80s, and I started seeing mass exodus. All those doctors, engineers and technologist sons of Bade Bhaiyya moved away, along with Bade Bhaiyya to foreign countries (USA, Canada etc), and one son moved to South, Bangalore. The only days of hustle and bustle I experienced were when these grand children got married one after the other. It was a strange experience. All these youngsters, who had accepted all my short comings of space, darkness and 'old' fashioned looks during their formative years, started finding faults during those short visits. Some even would stay in other people's homes. I became an empty nest for Dadaji. He was alone. Yes, I was obliged by getting a phone installed within my premises. Dadaji did not have to go to post office to receive disturbing news any more. But then, I was not alone. Many homes in our village had gone through similar phase of emptiness. I was looking depressed. Dadaji left this world, alone, in my lap. I cried silently. People left mechanically soon after rituals ended, and I saw a big lock being placed on my main door. I became a mute witness of the 'growth', and 'development' around me. The greenery you see in my picture of youth was gone. New homes next to me came up, made of cement and concrete. Money was coming from abroad. 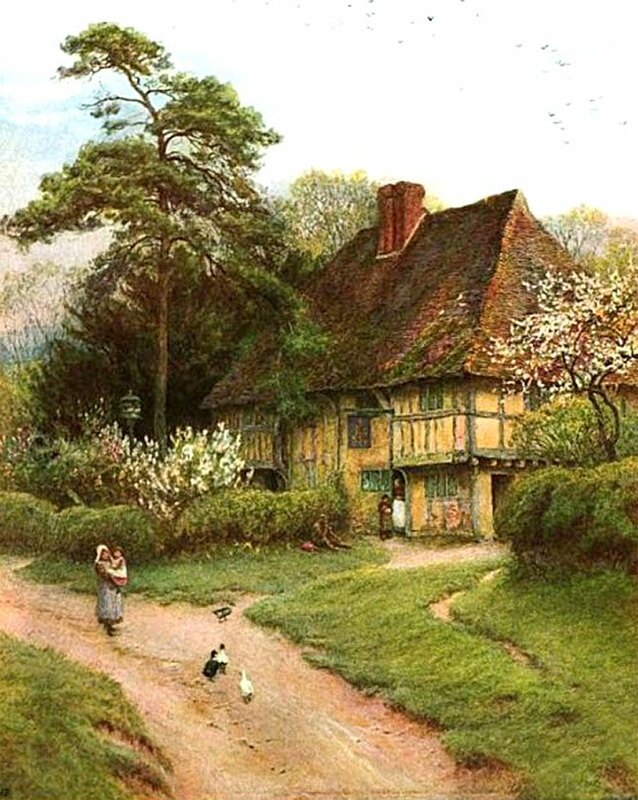 The new houses were physically very close to each other, but their doors did not open into each others'. I could sense people becoming jealous of each other. Phones were installed in many houses, and streets started buzzing with the sounds of motor cycles. But the people were talking in hushed tones. Hearts of the people were shrinking. Society was witnessing progress. No, instead, I was mercilessly demolished, so also the next door house. And our combined new avatar came up in a few months time. I was officially given the name - 'Vidya Dham'. A two storied, spacious, modern house with ample light and breeze, made up of cement and concrete. Was I happy? Can't say. I had to change with the times. May be I had become old fashioned. Modern needs had to be embraced. I thought all those youngsters will now come back, as all their complaints were addressed. But it turned out to be a mirage. Instead, a totally stranger moved into my second floor, and I learned a new terminology called 'tenant'. The solace was that the ground floor was occupied by Bade Bhaiyya. But he would lock me up often for short periods when he would visit different towns. 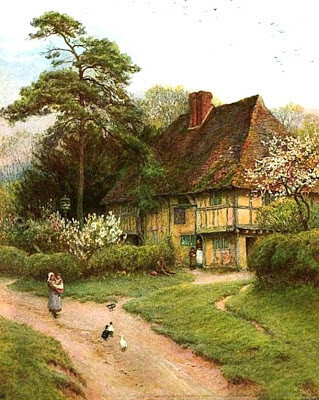 He had acquired a vehicle of his own and practically every home had a telephone installed. People looked strangers to each other. They all had their own vehicles and nobody needed to go to post office or for that matter even anyone else's house to make their communications. India was growing in stature. People were becoming independent! The new millennium had opened with a bang. I had accepted my fate of remaining locked for almost 11 months every year. Bade Bhaiyya would come for 3-4 weeks every year, do some good to the strangers by offering scholarships, or medical assistance, or even some monetary help for marriages etc and then pack up. The stranger at the first floor has become the care taker. To my mind, people have become neurotic, robotic, heartless, greedy and selfish. All in the name of progress! I still exist, even after Bade Bhaiyya has gone forever, in a hope that the third generation will returns with a breeze of simplicity one day. I will wait for that day. 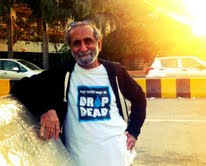 22nd March, 2013 is World Water Day. As a distinguished Indian painter and author, Aabid has written around 80 books but no story so moved him as the truth about water scarcity on the planet. “I read an interview of the former UN chief Boutros Boutros Ghali,” he recalls, “who said that by 2025 more than 40 countries are expected to experience water crisis. I remembered my childhood in a ghetto fighting for each bucket of water. I knew that shortage of water is the end of civilized life"
Around the same time, in 2007, he was sitting in a friend's house and noticed a leaky tap. It bothered him. When he pointed it out, his friend, like others, dismissed it casually; it was too expensive and inconvenient to call a plumber for such a minor job - even plumbers resisted coming to only replace old gaskets. A few days later, he came across a statistic in the newspaper: a tap that drips once every second wastes a thousand litres of water in a month. That triggered an idea. He would take a plumber from door to door and fix taps for free - one apartment complex every week end. Let us mend out taps this week, and perhaps of our neighbours' and friends! The theme for the month is "Truth is stranger than fiction"
Hari was the 14th child to be born to his parents, after a gap of 11 years from the 13th. His father was on the verge of retirement when Hari made his appearance. At the time when the second World war was just getting over, and the World was heaving a sigh of relief, a war in Hari's little World was brewing up, even before he was to be born. Almost the day he was conceived, his mother had started experiencing cold war from her husband, as though it was entirely her fault. In today's conditions, with the number of ways in vogue for avoiding pregnancies, Hari, and perhaps most of his siblings, would have never seen the light of the day. But then things were different then, and Hari had to come to this World, and go through his share of suffering. Ever since Hari started understanding, he understood one thing very clearly, that his father was far from being pleased with his arrival in this, and his World. His father was a medical doctor, and for some reasons he had started believing that arrival of Hari was ominously bad for him and his family. In fact, he was so insensitively vocal about it that he would call Hari, and introduce him to his friends, visitors and even strangers as 'a curse' thrust upon his family by the high Heavens. Little Hari was incapable of digesting such frequent insinuations. But the dictatorial environment in his patriarchal south Indian home could provide no sympathy or succor to him. The unbearable, constant notes of rejection during his formative stages would drive Hari on the brink of depression. Only the warmth of his mother, and being good at studies saved him from succumbing to the thoughts of committing suicide. However, as the teen years gave way to the adolescence, young Hari developed the coping up skills with the adversities at home. But, he also started realising that the frozen anger against his father, since the early childhood days, was slowly transforming into a deep rooted hatred for him. Every day added to his life, would add to the ill-feeling, repulsion against the now septuagenarian, frail old man. Hari was no longer a helpless child. He started dreaming to move out of the home, live in a hostel, and perhaps never to go back to the house which housed all the echoes of the invectives, and the ill-will that he was subjected to. God heard his pleas, or so he thought, when his father agreed to his admission to the medical college, and there for, moving out to a hostel. Hari breathed some freedom. His blocked talents started surfacing, and soon he was a popular student. Home ward thoughts would cast a dark shadow at times, but he was determined to moving forward, and never look back. Very soon Hari was part of the college milieu. His subtle humour and sharp mind won him many hearts, and he got elected to be the hostel prefect. Main job of prefects was to handle expenses of the hostel mess, and it was a tradition that at the end of their tenures the prefects would be seen in a new suit! However, Hari did not stitch a suit. On the contrary, he managed with lower per capita contributions of the students. This, very cleverly established him to be 'Mr. honest Prefect'. The inside story was different, though. Hari too had made some chunk of money, not enough for stitching a suit of course, but he did not show it off! In fact, he had learned the art of 'fleecing' money even from his father. False and puffed up expenses were shown to get extra money which would go into buying dirty books and extravagance. Was it a kind of expression against his father? He did not know. The college life was going on smoothly, creating a niche for himself, and then something hit him. Life is not always smooth. Hari got deeply influenced by the clarion call made by Gandhiji's grand son to join the group who would work to change the World. India was just getting into its 'teens' as a free nation, and had alredy started showing signs of corruption, discrimination, and the other ills. The call was to change the society. Hari found himself at the camp in the hills of Maharashtra. A high impact input given at the camp demanded of the men and women to begin the process of change with themselves. Absolute Purity, Honesty, Unselfishness and Love (PHUL) were the standards given to examine their lives against, and jot down where all they had deviated. And then consciously go about putting them right. Simple to say, but difficult to put to practice. However, the motivation created was so strong that most of them returned the stolen library books, paid back the ticket less travel costs to the local bus services, and made up the broken relationships with friends and relations. On his part, Hari, with great difficulties of fighting the fear of losing his image of 'Mr Honest', managed to return the 150 Rupees he had made while managing the mess. He received rather positive reactions from one and all at the college. This boosted his confidence. And some heart touching positive stories from some of the camp mates about 're-making' their broken relationships further buoyed his courage and decided to re-make his relationship with his father. Hari wrote a long letter to his father, expressing his angers, hatred, frustrations, feelings..etc about his father. He also confessed about extracting more money from home for his wrongful activities at college. He asked for forgiveness. He felt light. He got good sleep. He posted the letter to his father the next day. He had only heard from his camp mates about great re-unions they had experienced. But now he was eagerly awaiting similar moment in his life. He literally started dreaming his father hugging him and warm trail of tears wetting their shoulders, and... Often he would be lost in his dreams. It gave him a huge boost of zest for life. But, then, a few days passed and he did not realise that there was no response from his father so far. As the days turned into weeks, his enthusiasm turned into suspicion. Very reluctantly he called his uncle, and what he heard from him broke him down. It dawned on him how the truth was stranger than the fiction he was weaving in his mind. P.S. : The truth also is that Hari's father ultimately became very proud of Hari( strange, isn't it?) for what Hari achieved in his life following those 4 standards in life, Purity (of thoughts), Honesty, Unselfishness and Love. The whole yesterday was spent watching on TV several stalwarts shredding the annual union budget presented by our finance minister. 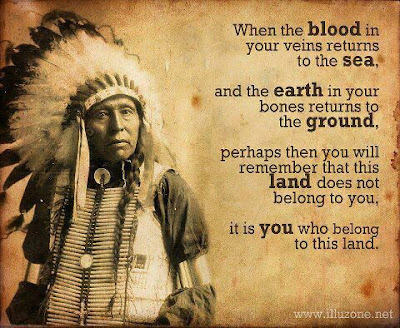 So much of materialistic talk, and then I come across this Native Indians' wisdom on belonging. A good study in contrast. Fit to be an on line Quiet Time thought. Hope it induces some inner churning. Do report your churning.